On the treeless green hills, I watched a herd of unusual looking cows grazing. What I didn’t know was that there are “magical” nutrients in the grasses of the Magdalen Islands. 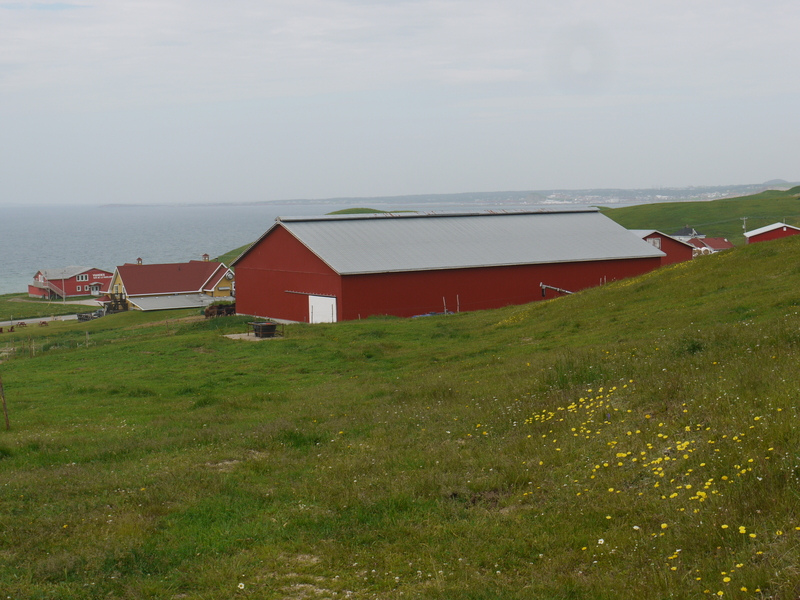 The Magdalens or Îles De La Madeleine, are a group of 12 islands in the mouth of the St. Lawrence River in Canada. The population of 12,000 plus residents live in colourful homes on six islands linked by long and slender sand dunes. The islands are part of the province of Québec and the culture is mainly Acadian and French Canadian, although there is a small English speaking community of those of Scottish and Irish heritage. The islands can be reached by air and sea from Montreal or Prince Edward Island. 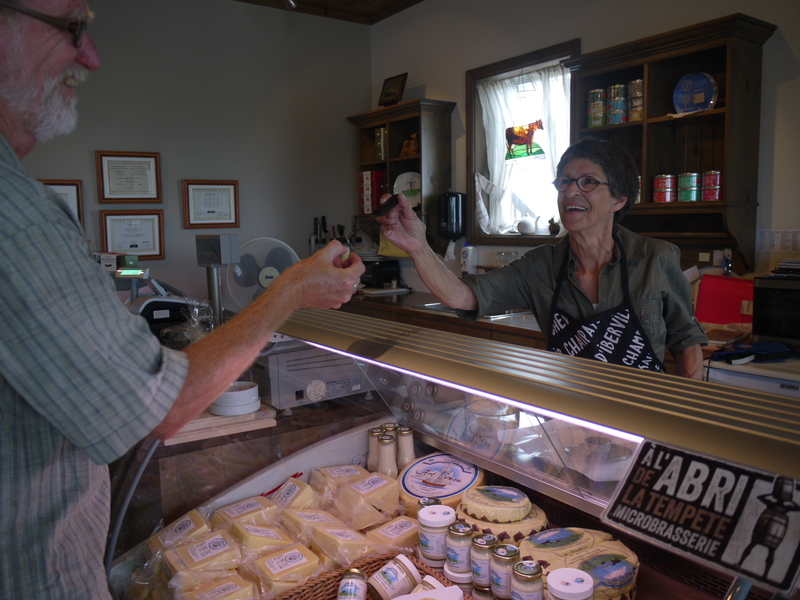 On a visit to the Fromagerie Pied–de–Vent on Havre–aux-Maisons, employee Gilberte Delaney told me the story of how a visitor from mainland Québec visited the original beef farm on this spot and tasted some milk from a dairy cow. He tasted a difference in the milk. Could it be the effects of the salty sea air on the rich plant life? He convinced the owner to give up his beef business and bring a special breed of dairy cow to the Magdalens from Québec called the “Canadienne.” And so it began. Two generations of the Arseneau family have been working this farm, and the cheese definitely has an exceptional taste. The current owner is Jérémie Arseneau who started the cheese production in 1998. A visitor samples cheese at Pied-De-Vent. Production is done by hand using modern equipment for part of the process, by cheese artisans. Milk is piped to equipment from the barns, and is slowly heated to produce curds. Yeast, lactic acid and rennet are added. Once thickened it is drained, put in molds and soaked in salt to extract moisture from the cheese so it becomes firm. It is then set to ripen from the outside to the inside. Five kinds of cheeses are produced and different cheeses are ripened for different lengths of time. We watched a video that taught us of the cheese making process and then we were treated to some samples of various cheeses made by their artisans. The names were romantic and evocative of the stories and scenery of the island, such as Pied de Vent that means Sun through the Clouds, describing a common sight when you visit the Magdalen Islands. I found many different foods of the island like to share the same mixing bowl. Beer from local microbrewery, Á l’abri de la Tempête, is used in one cheese. 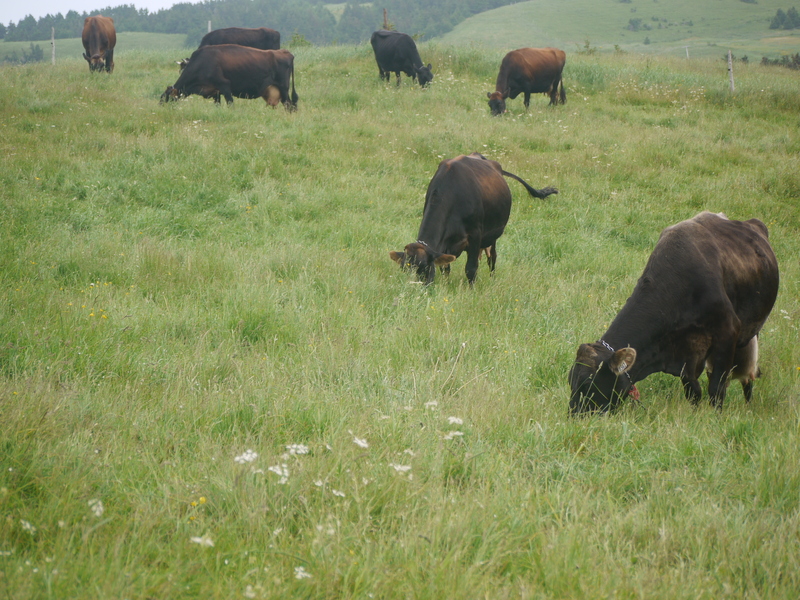 I tromped through the special fields full of wildflowers, grass and wild herbs to find the Canadienne cows that had been sent out to pasture. They were too busy eating to lift their heads with a greeting. A special business – this cheese making by the sea. Pied-De-Vent farm and dairy as seen from the hills where the cows graze.